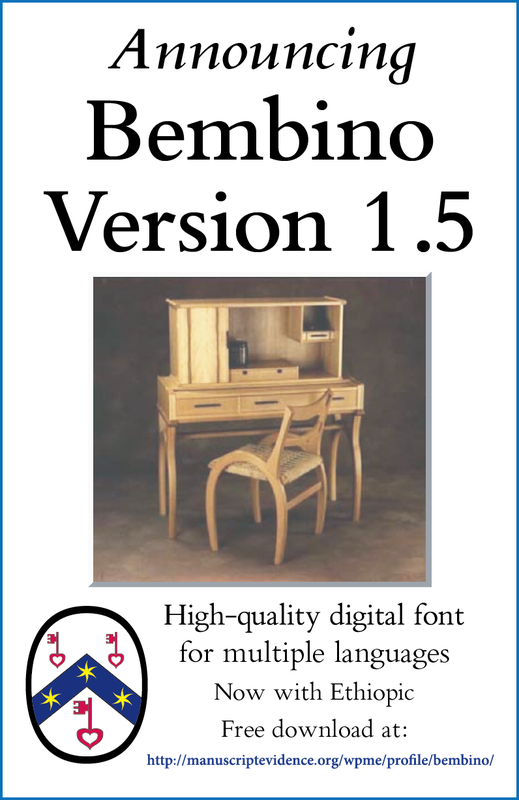 Years in the making, through consultation with scholars, students, and readers in a wide range of fields, Bembino is designed to allow multiple languages to live in harmony on the same page. 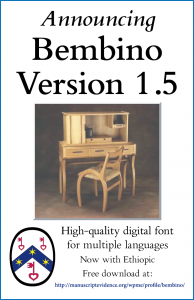 We offer Bembino Version 1.5 (2018), together with an updated version of the companion Booklet. Available FREELY for download here. Would you like further elements? Please Contact-Us . Continuing to reflect on the values of presenting materials, whether text, image, or both, upon a page or writing surface, we have decided to proclaim the principles which guide our approach to layout of posters. 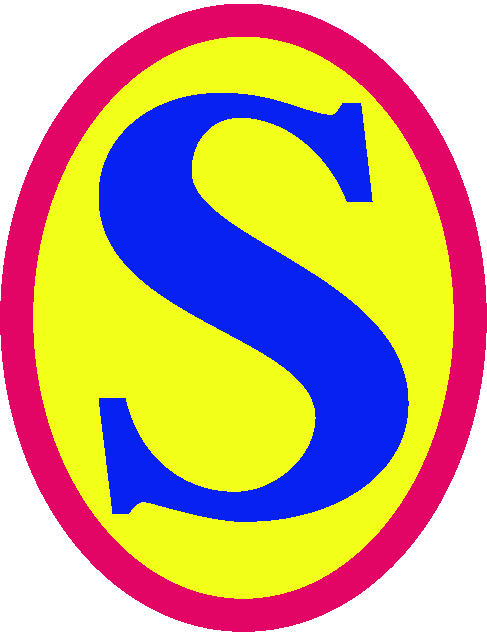 You may have noticed some of them at our events, on the Posts of Pages pertaining to them, and/or in the Poster Gallery on this website. You may know already about our views about design and layout, for example in the Illustrated Catalogue (our own design throughout, apart from the front covers and the promotional booklet), in our Style Manifesto (we are not so shy, uncommitted, or wimpy, as to call it a “Style Sheet”), and in all of our Publications. Now we offer a similarly clear, and polemical, description of principles which we believe should govern the processes, and products, of Designing Academic Posters. The 4-page Booklet, set in RGME Bembino, describes and illustrates the aims. Experience shows that some of you may prefer the second option, so we continue the provision. What do you think? We invite your comments. We’d be glad to improve. Please let us know your favorites! We’d be glad to hear from you! Comments here or Contact Us. 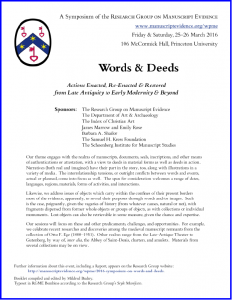 We have fixed the broken link for downloading the Program Booklet, with Abstracts and Illustrations, for our Symposium in March on “Words & Deeds”, exploring a rich array of subjects. 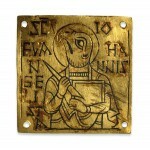 The subjects range from the Late-Antique Theater to Gutenberg, by way of (among others), the Abbey of Saint-Denis, charters, and amulets. 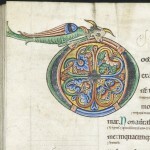 For example, we celebrate, and illustrate, recent researches and discoveries among the medieval manuscript remnants from the collection of Otto F. Ege. 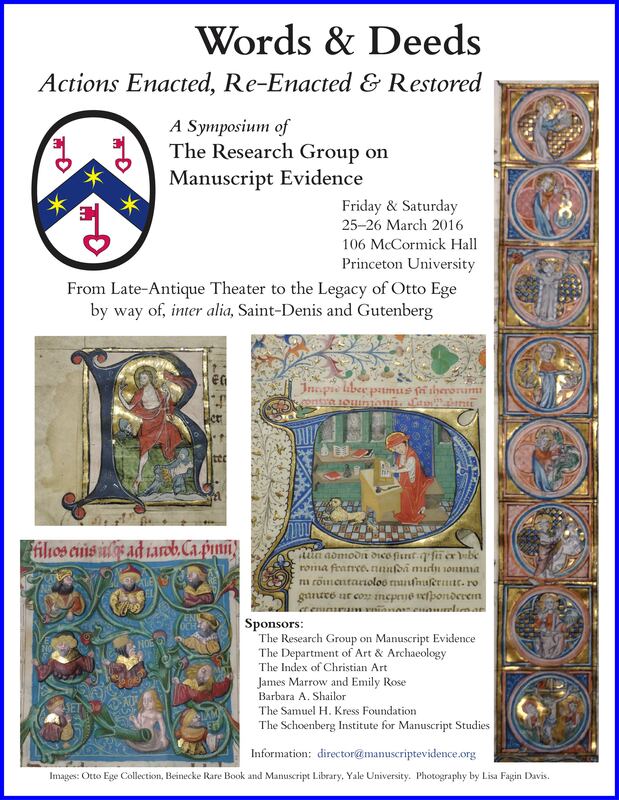 The 2016 Symposium Announcement and the 2016 Symposium Report provide additional details. You may find the Booklet here. Laid out on our copyright font Bembino, it conforms with the principles of our Style Manifesto and celebrates the contributions of experts in various fields of study and interest. 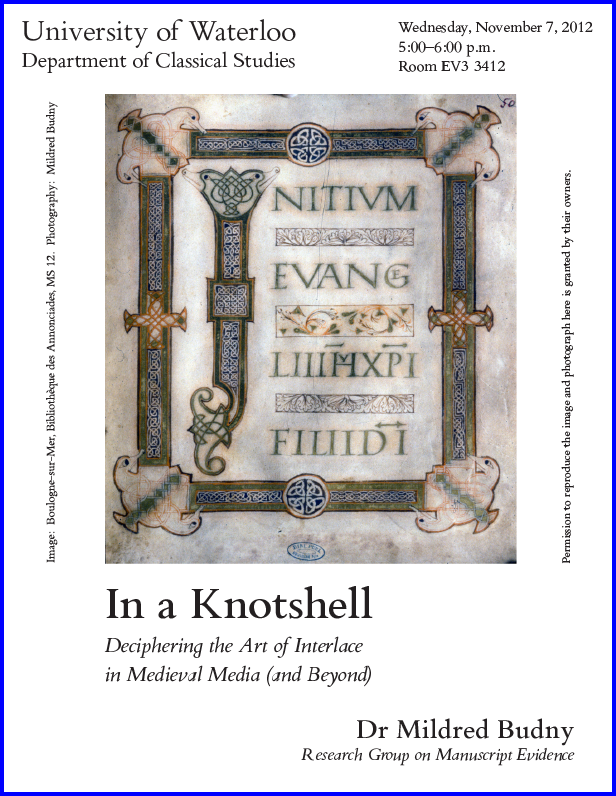 This Report for CARA (Committee on Centers and Regional Associations of the Medieval Academy of America) has appeared in its 2016 June Newsletter (page 13). We are glad to be part of the organization. Like last year, this year our Director attended the Annual CARA Meeting, which regularly follows the Medieval Academy of America Annual Meeting. This year it took place in Boston. The Report of our Group’s activities for 2015–2016 is now published in the CARA Newsletter, for which we thank Lisa Fagin Davis (our Associate), Executive Director of the Medieval Academy, and her staff. 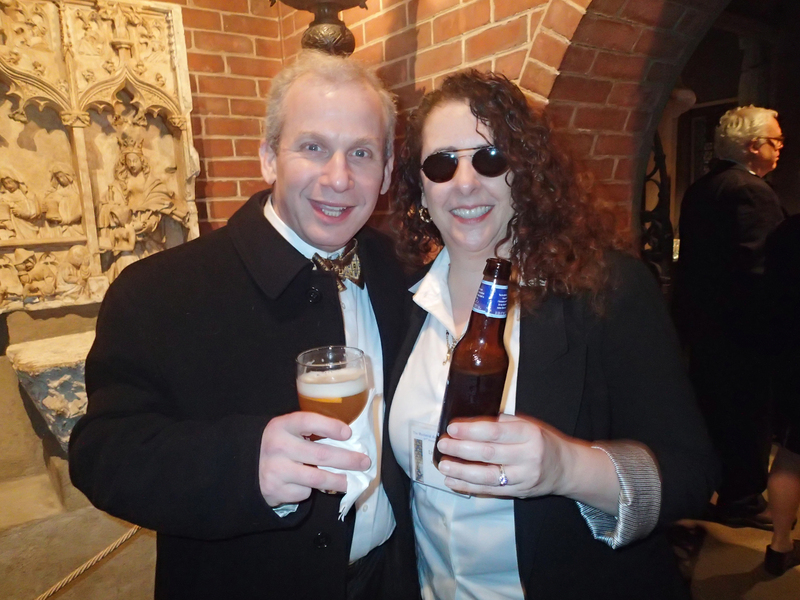 We congratulate Lisa, shown at its closing Reception, for the success of the 2016 Meeting in Boston. 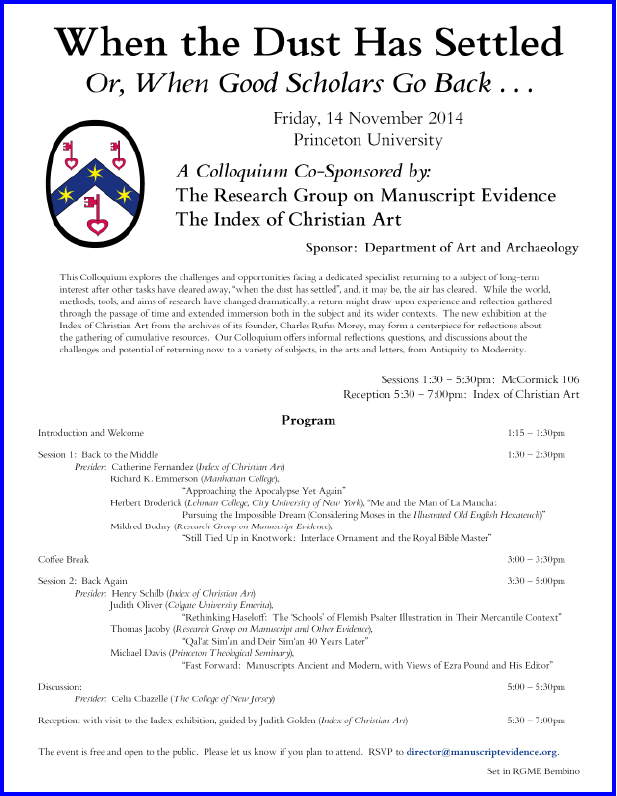 Here we reprint the Report, with the addition of active links to its items, plus some illustrations. First we set the Report briefly in context. 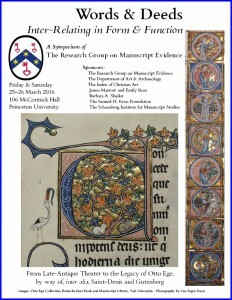 The Research Group on Manuscript Evidence reports its activities accomplished at the 2016 International Congress on Medieval Studies, held at Kalamazoo, Michigan. we now Report its achievements. 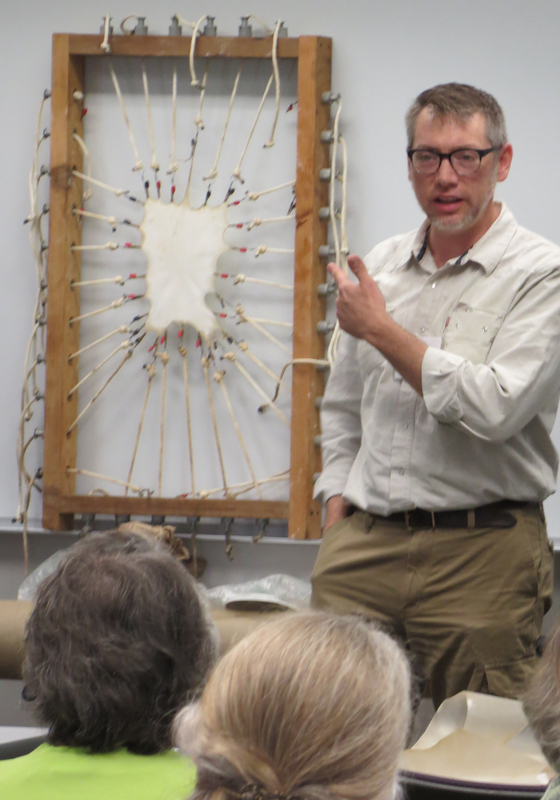 They include the notice of a couple of late changes to the Program of individual Sessions, the unveiling — with the publication here — of both the Posters for our multiple activities at the Congress and an illustrated Program Booklet for a pair of co-sponsored Sessions, and other developments. These publications, as is our practice, are set in our copyright multilingual font Bembino and laid out in accordance with our Style Manifesto. You may view them below. 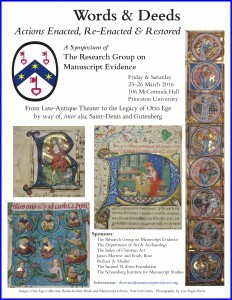 In its Style Manifesto, the Research Group on Manuscript Evidence defines the principles of its approach to publications. Foremost is the principle that form and content must be appropriate for function and audience. 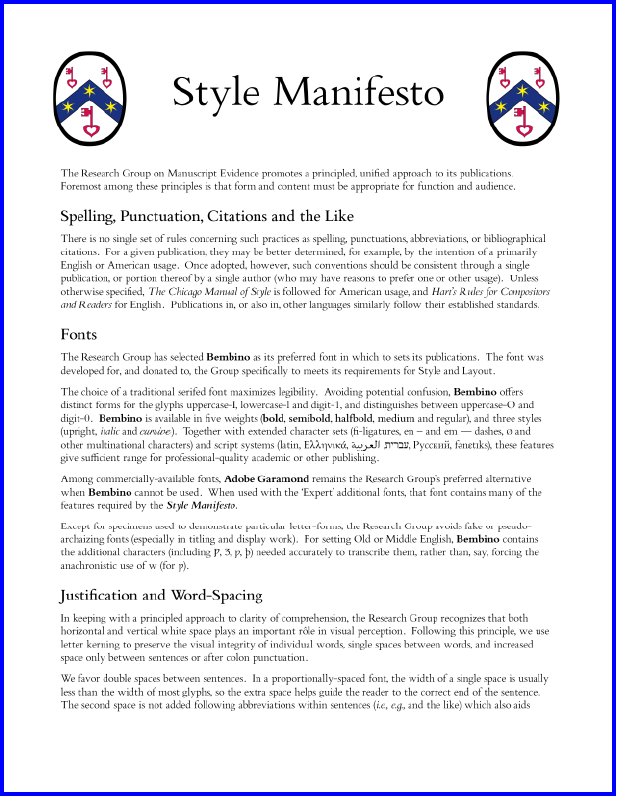 As the Research Group launches its new, updated official website in May 2015, it issues the new version of its Style Manifesto. Circulated as a booklet, it is available here. It now takes the form of a 4-page booklet, laid out in our own multilingual font Bembino. 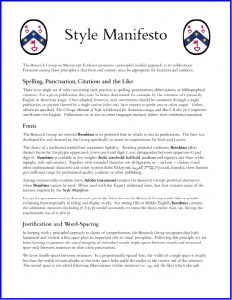 The Style Manifesto describes, demonstrates, and illustrates our continuing dedication to the principled, unified approach to our Publications. 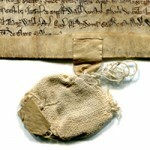 These principles pertain, of course, also to the reproduction of images, including photographs of manuscripts and other forms of material evidence. In the new booklet, the horizontal pair of half-page plates present 2 views of the same late-medieval manuscript page (subject of our blogpost on The Mass of Saint Gregory, Illustrated), un-cropped and un-retouched. These views represent photographs taken with the same lighting but different backgrounds, and with both a scale ruler and a color guide in view. Such practices can supply guides to convey the integrity of the object and to aid the viewer to assess the accuracy, or otherwise, of images as presented variably in print or on screen. They may encourage consideration of the specific circumstances and choices governing any given photograph, which might represent only some aspects of the original which other choices could supplement, just as different snapshots or portraits may reveal different aspects of the same sitter. This position fosters the integrated approach which the Research Group seeks to promote.